Across Australia, many children benefit hugely from support provided by Vinnies. Our services come in many forms and include programs that assist children with developing their educational needs. 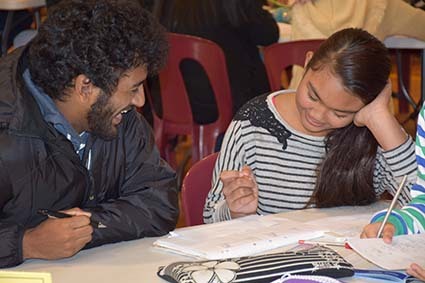 In Victoria, the Dandenong Tutoring Program was established to offer educational support to disadvantaged young people. 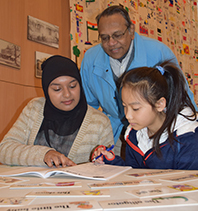 The program offers tutoring for students from year five to year 12 in the areas of literacy and numeracy while promoting personal and social confidence. The majority of students are from culturally and linguistically diverse families and many have complex social, cultural, educational or personal backgrounds. During 2013-2014, this program provided over 6,480 tutoring hours; 7,800 volunteer hours including preparation, planning and organisation; and 3,240 morning snacks to feed healthy and active minds. 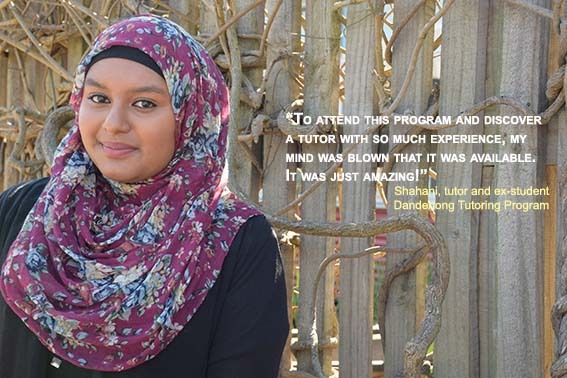 The impact of the Dandenong Tutoring Program cannot simply be measured in numbers. It is much more significantly measured in the personal impact of our everyday encounters and the transformative nature of the relationships formed. Being part of people’s stories is an honour and we are privileged to be entrusted with the care and support of young people and their families who are working towards a better future. The program regularly encounters great strength of spirit and witnesses the value of positive and supportive relationships. From a year five girl who excitedly told us that she had the courage to answer a question in front of her class, to the year 10 boy who asked for support to fill out a scholarship application for VCE, to a mum who spends two hours practising in order to be able to do a grade two reader with her child, the stories are varied and heart-warming. Through education, Vinnies is changing people’s lives. Shahani developed a good working relationship with one tutor in particular, Walter. “Even now he’s one of my biggest inspirations. He’s a really amazing person,” she says. How can I find out more about this program? The St Vincent de Paul Society across Australia has many programs and services that would not exist without its members and volunteers or the support of the wider community through financial and material goods donations. The Society is always grateful for the generosity of the community who assist us through financial or material donations. To find out how you can make a difference in someone's life today visit the donate section of this website. Leaving a bequest in your Will to the Society is a greatly appreciated way in which you can support our future work. We also invite you to take a moment and check out the Get Involved page which highlights more information on becoming a member or becoming a volunteer as well as other ways in which you can help the Society.